The fastest way to improve your Pickleball game is to practice, practice, practice! Men’s Singles Pro Gold from the Minto US Open Pickleball Championships 2017 – Yates vs. Johns Watch 18-year-old high school senior, Ben Johns, take on his pickleball friend, Kyle Yates, in a tight gold medal battle during the Men’s Singles PRO match at the 2017 Minto US Open Pickleball Championships. Having trained together in Fort Meyers, FL, both have experience watching each other’s game which makes the match more interesting. This close match even includes a fantastic comeback in the first game to tie it up 9-9! Good sportsmanship and an obvious mutual respect between these two top players are on full display here as you watch this impressive game. Pickleball Clinic (Pickleball 1.0) with Tami and Jerry. Click the PayPal button to pay $25 for the 2 hour clinic. Introduction to Pickleball (Pickleball 1.0)Meet up members organizers, Kurt and Bob, have been lucky enough to meet Jerry and Tami, co-founders and instructors of Pickleball Naples. 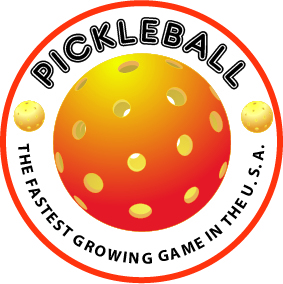 They would like to help us all understand the game of Pickleball and are offering us a SPECIAL 2 hour clinic on Pickleball.Payment required in advance so we know how many players we will have in the clinic. Thanks. 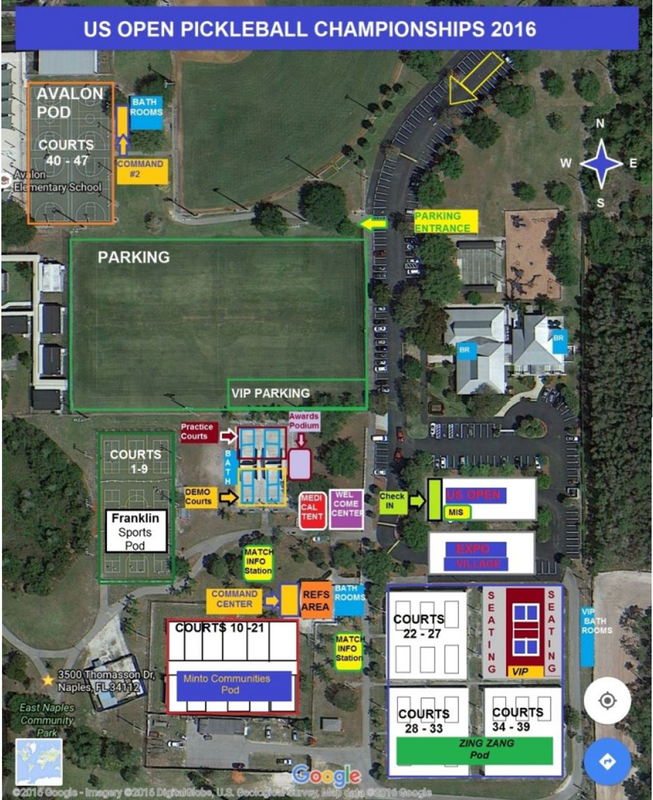 The cost for clinic is $25 per student for 2 hours.The clinic will consist of learning:-Basic strokes: dinks, volleys, punches, smashes, (it’s really not a violent game) service, ground strokes and the 3rd shot. Everyone on the courts practicing the seven basic strokes under the supervision of Jerry and Tami. Remaining time everyone plays Pickleball. Minimum 5 players, maximum 9. The cost for clinic is $25 per student for 2 hours. 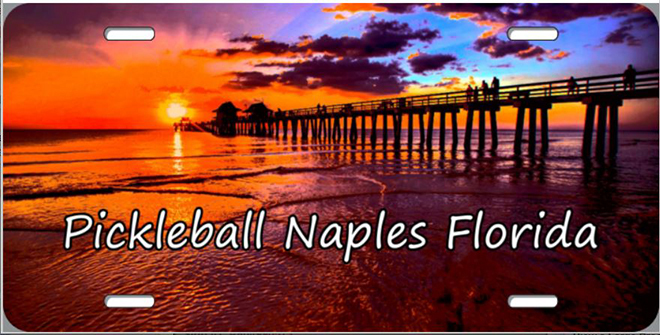 Pickleball Naples LLC is also an authorized PaddleTek distributor, offering paddles for sale to only our students. Please bring sunscreen, water, and a hat. Please wear shoes with a flat sole if possible. A court shoe, not a walking shoe. Get ready to have some fun! 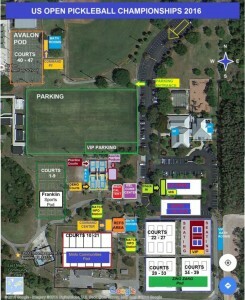 Look forward to seeing you on the courts! Tami Thomas: Instructor and co – owner of Pickleball Naples LLC wins Gold at the first US Open Pickleball Championships in Naples Florida. Tami beat two 5.0 players to get the Gold in the 50+ womens singles division. 4 (four) 1.5 inch diameter round. Our magnets feature a high-gloss, weather-resistant finish, a heavy magnet back and high quality, full color face print. $10.99 free shipping. Lower 48 states only. Please contact us for international shipping. I have been taking Yoga for 4 weeks, once a week. I have been sleeping better and I feel more relaxed physically and mentally. I have a long way to go my poses don’t look quite the same, I work on them every day! Beautiful full color license plate. $12.00 and $4.00 shipping. 1. When you are learning to play pickleball, never avoid hitting your backhand ground strokes or volleys. If you avoid hitting your backhand you will never master the stroke. 2. When playing during a windy day keep track of the wind speed and direction constantly because it does change at times. If you play the wind properly then it will build confidence in yourself, in that, the wind is bothering your opponent more than yourself. 3. When you are feeling a little tight during a match, don’t hit tentatively or too slow. Hit at your normal steady pace, but give yourself more leeway to hit your target until your confidence returns. 4. Make a mental book on your own attributes and deficits. Only hit shots that you feel are a high percentage for your own ability. Know what shots you can make more than 50% of the time. Do what you do well and practice the things that you don’t do well then use them when you can make them 50% of the time. 5. Bounce up onto the balls of your feet, in the ready position, at the point of contact of the ball on your opponents paddle. A moving body reacts quicker than a stationary body. 6. If both backhands of your opponents are at the middle of the court, hit down the middle of the court. 7. If your shot makes your opponent take two steps or more your chance for winning the point increases immensely. 8. Don’t back up to play a dink off the bounce, when you can hit the ball in the air. Always try and hit the ball with your weight going towards the net. 9. Make contact with the ball at the highest possible point in the air when volleying and waist high on the bounce for your ground stroke. It will be a higher percentage shot and open up more angles with less chance of putting balls into the net. Play Steady: The team with the most unforced errors loses. Not the team with the fewest winners. Placement is more important than power. Keep the ball as low as possible for every hit, unless you must make a defensive lob. Place the ball at the opponent’s feet or bounce the ball right beside your opponent. He must hit the ball up, which quickly puts him on the defensive and you on the offensive. The team which must hit the ball up most of the time will lose. Keep the ball at your opponent’s feet no matter where he is on the court. What’s going on in your mind affects your pickleball game big time. Do you want to learn how to play the mental game? Want to make a quantum leap in your pickleball skills? Read on. Long before my pickleball life, I entered a one day, round-robin tennis tournament in Van Nuys, California. The day before the competition, my two Yamaha rackets were stolen and the only available racket was my daughter’s. She had a habit of picking up the ball by scraping the tip of the racket on the court. The scraping wore a hole in the hollow graphite frame that you could stick a finger in. Since I had no chance of winning with that racket, I decided not to take the tournament seriously and just play for fun. Players were divided into two brackets of nine players each. Because I had nothing to lose, I played out of my mind. I wasn’t thinking about it but my game was on a high. I beat all eight players in my bracket. I played the winner from the other bracket in an eight-game set for the championship. He was a better player but I was still playing out of my mind. I was ahead 6 games to 2. Only two more games and I would win the trophy.Then, I began thinking, “Oh my gosh, I’m going to beat this guy. I’m going to win the tournament.” That was the beginning of the end. When I started thinking about winning, I started losing. I didn’t win another game. I played in my mind rather than out of my mind. Easy because your subconscious can handle an unlimited number of tasks at one time. Natural because you don’t have to think about it. It’s the same in pickleball; each shot has a myriad of things to think about, things like short backswing, stiff wrist, paddle face angle, feet movement, bent knees, weight on toes, push the paddle, follow through toward target, keep ball low but over the net, don’t step in the kitchen you idiot, etc. That’s too much to think about. To be successful each shot must be made a habit and performed at a subconscious level without that pesky conscious mind getting in the way. How do you do that? Answer in next month’s e-Newsletter. How do you serve deep and in the court every time? Consistently drop the ball in the kitchen from the backcourt? Routinely smash a high ball and keep it in bounds? The answer is by etching the mechanics of each pickleball stroke into your subconscious mind — practice, practice, practice. By practice, I mean correctly repeating the same shot over and over. Some readers might be thinking that practicing pickleball shots is a good idea, but they don’t have an opportunity to practice. No one conducts drills where they play and they can’t get some chump to feed them balls so they can hit each shot 50 times in a row, including the serve, serve return, drop shot, dink, volley, smash, lob and overhead. 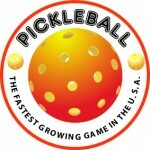 Let’s face it; the majority of pickleball players would rather play games than participate in practice drills. Well, that’s a dilemma: How are you going to practice technique if there is no one to practice with? Here’s good news; there is a way you can keep playing games and practice at home, while waiting for an appointment, or riding to work (assuming you are not driving.) You can practice in your head! Mental practice is as effective, and arguably more effective, than physical play. A study in Russia showed that optimum benefits in a sport were obtained with a ratio of 25 percent physical practice to 75 percent mental practice. Mental practice works because your subconscious mind does not know the difference between real and imagined. Vividly picturing and feeling yourself swinging a pickleball paddle and making a shot in your mind’s eye activates the same patterns of neutrons in your brain as when you physically make the shot. Mental practice forms and reinforces the software for making a stroke. Moreover, mental practice is perfect. Each time you make a shot in your mind’s eye, the swing is correct and the stroke sends the ball to the right spot; each time you reinforce the software in your brain for a perfect shot. On the other hand, when you play for real, every shot is not perfect; in which case, you are reinforcing the software in your subconscious for poor technique. You can raise the level of your game by practicing that dink, kill shot, and volley on a daily basis — in your mind. However, there is a key element to mental practice, which I’ll share in the next month’s article. There are many ways to get into alpha. Here’s the most common: sit in a comfortable chair and let your body relax. Relax one muscle at a time starting from head to toe (or toe to head, it makes no difference.) It might help to imagine a wave of light flowing down your body as you relax each muscle. Pretend this wave has the magical ability to totally relax your muscles, all your muscles including those involuntary muscles controlled by your subconscious. Did you catch the word “let?” Let your muscles relax; muscles can’t be forced to relax. If imagining a magic wave of light sounds silly, here’s another bit of mental wisdom: Your subconscious mind is illogical and immature. So imagining silly images makes a stronger impression on your subconscious than using logical, sensible ones. Now that you are physically and mentally relaxed and in a dreamy state, see yourself executing an ideal drop shot from the service line. See yourself returning drop shots from all positions on the court. Each time you hit the ball, it drops in your opponent’s kitchen. See and feel your feet moving to get into the best position before you swing. Feel your leg muscles as you bend your knees to hit low balls. Picture making each shot over and over — always perfect. See it, feel it, hear it and delight in the emotion connected with hitting precise shots. Emotion, the electro-chemical power in your subconscious, makes this process more effective. Repeat this scenario with each stroke – serve, return, drop shot, dink, volley, lob, smash and overhead. Athletes at all levels use guided imagery. Pitchers see themselves in their mind’s eye throwing the ball to an exact spot. Golfers see themselves making a perfect swing and picture the ball landing on the green near the pin. Skiers map the fastest way down a slalom course and imagine making perfect turns through each gate. 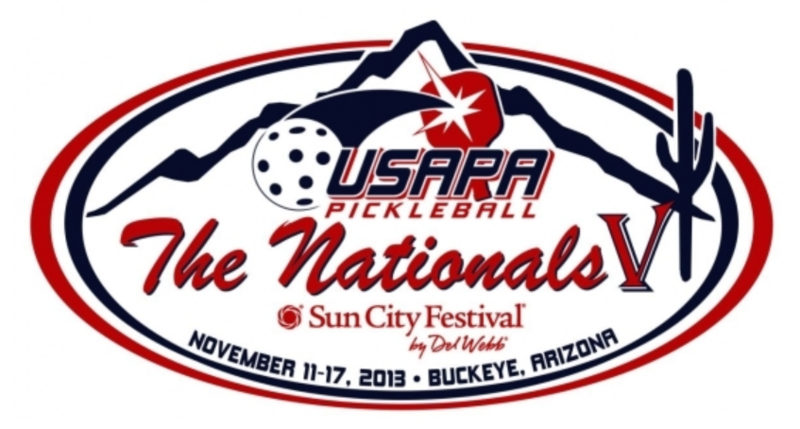 Pickleball players envision deep serves, dazzling drop shots and blazing put-aways. Try it. And soon it will become habit! Your conscious mind can only do, or think of, one thing at a time, whereas your subconscious mind can literally do trillions of things at a time. It follows that smooth, coordinated (good-looking) strokes, are executed with your subconscious mind. 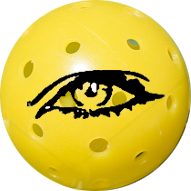 You have practiced your pickleball strokes until they are ingrained in your subconscious and they have become habits. Since your strokes are now habits, you don’t have to consciously think about them. All you have to do is get your conscious mind out of the way and “let” your subconscious play the ball. Getting your conscious mind out of the way and “letting” your subconscious play is not always easy. Your conscious mind has an ego that thinks it knows better, so it wants to be in control. Two bads happen when it takes charge of your pickleball play. One, you can’t play well when you are thinking, “I’ve gotta hit a winner; Should I hit a dink or smash it? Why did I hit that last shot into the net? That was dumb; What’s the matter with me? Look at all those people watching me.” Two, and even worse, you start thinking about winning or losing. These thoughts introduce some degree of fear — the fear of losing or the fear of being embarrassed. Any aspect of fear undermines confidence and sends your game down the tubes. Here’s how to get your conscious mind out of the way: use your conscious mind’s limitation (i.e., that it can only think of one thing at a time) to your advantage. Keep your conscious mind preoccupied with watching the ball. Your conscious mind’s job is exclusively to focus on the ball. Think, ball as you watch it. Be aware of its flight path, its velocity, etc. If you concentrate on the ball, your conscious mind cannot interfere with your inner athlete, your subconscious. In a nutshell, when your conscious mind is focused on the ball, your subconscious mind is free to make that perfect shot. The Mind Game… Try Harder? Play Worse! Ever had a night when you couldn’t get to sleep? You got frustrated and tried harder. The harder you tried to sleep, the more awake you became. Or you were winning a pickleball match and you just missed a couple of easy shots and started losing. You vehemently urged yourself to play better. But the harder you tried to play better, the worse you played. These examples demonstrate that the harder you try to do something or the more you will yourself to play better pickleball: a) the harder it becomes to do it, and b) the worse you do at it. Willing yourself to do something is a conscious process. Your conscious mind can only do one thing at a time, and it can’t directly control your involuntary muscles. Thus, you don’t play your best pickleball when your conscious mind dominates. Your subconscious mind, on the other hand, can do trillions of things at a time without conscious thought. It also controls involuntary muscles that are required for good strokes and rabbit-like movement. It is where your pickleball strokes are stored as habits so you can execute them smoothly without thinking about them. Plus, your subconscious computes information a million times faster than your conscious mind. Thus, you play your best pickleball by suppressing your conscious mind and allowing your subconscious to dominate. Pushing yourself to play better pumps up your conscious mind, minimizing your subconscious mind. Hence, urging yourself to play better achieves the opposite — you play worse. You’re in a tournament and you’re playing badly. You’re ticked off at yourself. What are you going to do? Tell yourself to quit making mistakes? Will yourself to play better? Don’t bother; it won’t help; you’ll probably play worse. Instead, do the following: 1. Play in the Now — Your conscious mind thinks in the past, present and future; whereas your subconscious only operates in the present. Since you want your subconscious to be dominant, keep your mind in the present. Don’t think about that snide remark your opponent made or the shot you missed – that’s the past. Don’t think about the consequences of hitting the ball long or about winning or losing — that’s the future. Focus on the ball — that’s the now. 2. Observe – Your conscious mind is the critic; it judges, discriminates and analyzes; whereas your subconscious mind accepts things literally. When you critique your strokes during a game, you bring your conscious mind to the forefront. To keep your conscious mind from taking over, don’t analyze your strokes, just observe them. If any adjustments are needed, your subconscious will make them — unconsciously. 3. 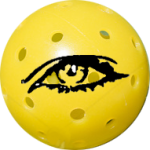 Watch the ball – Think about, and keep your eyes on, the ball. You can only focus on one thing at a time with your conscious mind. Focusing on the ball blocks negative thoughts, keeps your mind in the present and keeps your conscious mind from interfering with your subconscious mind. 4. Relax – Tension impedes court movement and thwarts good stroking. Top athletes don’t tense all their muscles while they jump, throw, catch or stroke – only the ones needed to do the job. Any additional flexing hinders performance. So loosen up. Take slow, deep breaths between points. 5. Act with confidence – You’ve spent weeks practicing your strokes and strategies. Your strokes are ingrained in your subconscious so you don’t have to think about them. Knowing your strokes are programmed in your subconscious gives you confidence that you can play as well, and better, than anyone in your bracket. Act with confidence; imagine you are confident and play confidently. A warm up is the act of preparing for an athletic event or workout by exercising or practicing for a short time beforehand. Warming up helps reduce your risk of injury and the aches and pains that come with exercise. The physiological reason to warm up is to assist your circulatory system in pumping oxygen-rich blood to your working muscles. The idea is to increase circulation throughout the body in a gradual manner. A proper warm up safely prepares the body for the increased demands of exercise. Cold muscles do not absorb shock or impact as well, and are more susceptible to injury. A warm-up helps you prepare both mentally and physically for exercise and reduces the chance of injury. During a warm up, any injury you have can often be recognized, and further injury prevented. 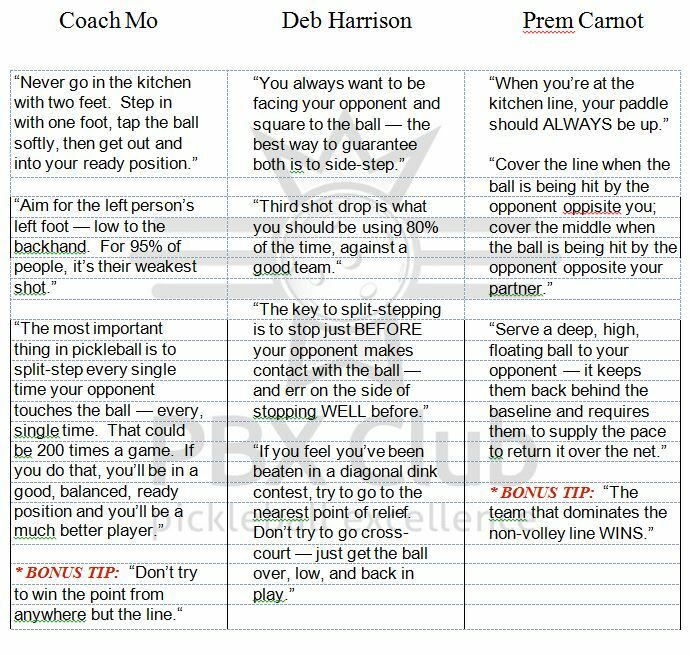 Mark Friedenberg comments in his book “The Official Pickleball Handbook” that 75% of all shots are won on errors. Do I need to say more…..just keep the ball in play any way you can. AND, don’t try a kill shot on your first opportunity unless it’s just perfect. Be patient and just get the ball back, preferably deep in the middle, while you wait for that perfect put-away! Your opponent may just hit the ball into the net. On most occasions, your opponent will “telegraph” where they are going to hit the ball with the angle of their paddle and perhaps their body just before they hit the ball. It happens quickly. Cover that area. Just one example: During warm-ups you can get an indication of your opponent’s potential weaknesses so that you can exploit them in the game. If they never hit a backhand shot….guess what. Also, when he/she returns a serve, if they tend to slide more to their backhand side then guess what. I’d serve to their backhand all day long and hit there as well during play. Watch for tendencies. If your opponent always hits the same shot to the same location…then cover it. The opposite holds true as well. You need to vary your shots! Too many players are hitting the ball back (horizontally) to their opponent while at the net. AND, the ball is coming right back! To win the point you should be hitting the ball at a down angle into the middle of the court at your opponent’s feet. If you’re hitting to your opponent and its coming back to you then your doing something wrong and may well lose that point. Always assume that the ball will be hit back to you. Be ready. Anticipate your opponent’s returns. If you hit a particular shot, where do you think he/she will return the ball…..THEN COVER that area. Hit for the open alleys. Make your opponents move. Don’t play catch! Hitting angles wins points. Have you ever watched the top tennis players and how they glide around the court? How they are always moving from side to side and front to back. That’s not by accident. Their feet are always in motion positioning their body to hit the next shot. The same should be true with the game of Pickleball. Keep those feet moving even when you’re at the non-volley line getting ready to hit that next shot. Planting your feet at the kitchen line is a no-no! I believe the game is won when all four players are at the net. Therefore you ask, what’s so important when you’re at the net. How about your reaction time for a start? If you agree, then keeping that paddle up and in front of you ready for a quick response to hit the ball is a key. It takes much too long to hit the ball when your paddle is either at your side or down below your waist. Try keeping the paddle up right in front of your face. Sounds funny but give it a try. Remember this is one man’s opinion. It is not written in stone. Try what he says, take what works for you! The purpose of this article is to share with you the winning strategies that have helped me win in the game of Pickleball. I’m sure that there are many other approaches but these techniques seemed to work for me and perhaps may work for you as well. It is not intended to be a comprehensive tutorial on how to play the game. How many times have you heard “just get the ball into the court”? Well, they’re right. Forget the spins and trick shots unless you’re very proficient. Instead focus on just getting the ball in play. Make them move if possible. If your opponent has a weak back hand then exploit that weakness, but always, always just get your serve in and preferably the deeper the better! Returning the ball to the center is always good because it makes your opponents move and guess who’s going to hit the ball. If at all possible return the ball so it bounces within a foot of the baseline. Never hit a short return! Keep them back and follow your return to the net. In my opinion, the game really starts with the third shot. I believe the player returning the service return has five shot opportunities each with its own complexity, level of difficulty and benefits. They all have an advantage depending upon the level of skill of your opponent. Choose wisely. A low probability of success and it’s the high point of the net. Test your competition and you may just surprise them. Again, a low probability of success with higher skill level players. I don’t recommend this shot with higher skill level players However, it works as a nice surprise shot. I would only use it when I’m significantly ahead in points. It’s a defensive shot and you need to be on the offense. A low shot over the net and into the middle of the court. I would use this shot most of the time. If successful, follow it up to the net. Your partner should watch the return as well and, if it’s good, follow you up to the net and be ready for net play. He or she should not just run up to the net without watching the return. Always work your way up to the net together. A very tough shot to achieve—- but effective! You’re hitting the ball from the service return to the backhand side of your opponent where it just drops over the net. You’ll both need to follow it up to the net together to be successful. The court is 20’ wide and 44’ long. The net is 36” high at the ends and 34” at the center. 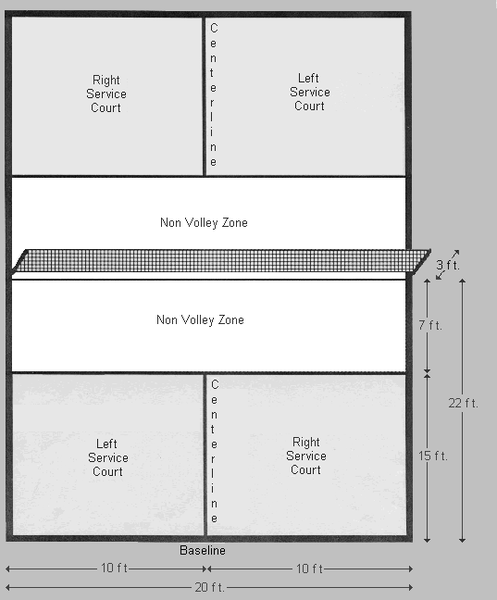 There is a 7’ Non-Volley-Zone (NVZ) on either side of the net. NVZ means you cannot hit the ball on a fly while standing in the NVZ this includes the lines. The lines surrounding the NVZ are considered part of the NZV. The serve must be underhand and hit on a fly, striking the ball below the waist. The person on the right always serves first. The serve must be hit cross court on the diagonal. The back line and the side line are considered good serves. If the ball hits the NVZ line or lands in the NVZ box the serve is bad and the serve is lost. There are no double faults; you only get one chance to make a good serve. The serving team has both players at the base line. The receiving team has one player at the baseline (the serve receiver) and the other at the NVZ line (the kitchen line). The receiver of the serve cannot hit the ball on a fly; the ball must bounce before returning the serve. The best position to return the serve is behind the back line (called the baseline). It is easier to move forward for a short serve than trying to move back to get a deep serve. When the ball is returned to the serving team, they also must let the ball bounce. After the 2 bounces, the ball can be hit on either the fly or the bounce. Your feet should be shoulder width apart, knees bent with your weight on your toes. The paddle should be held at chest level with the handle pointed to your body. The blade of the paddle should be perpendicular to the ground. Overhead drills are not going to work very well until the players have first learned to lob well enough to hit a lob to the player practicing overheads! After you can lob fairly well when returning a ground stroke or volley, then you are ready to attempt these drills. These drills are necessary not only to develop your overhead skills, but also to develop your ability to return an overhead smash with another lob. You will find that if you do these drills your lob will improve as much or more than your overhead improves. Drill 1 is good for two players. If you have 3 or 4 players, then drill 3 is much better because the player hitting overheads can practice hitting to different areas of the court. That also gives the two players lobbing practice in a more game like situation. Hitting overheads is quite tiring and even with 4 players rotating to the overhead position, everyone should get plenty of practice.